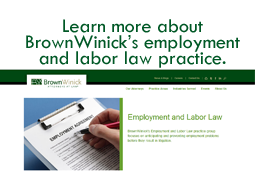 Workplace Wise - BrownWinick Employment Law Blog: Do I Need to Update Workplace Postings? Do I Need to Update Workplace Postings? YES! Iowa has updated its Job Safety and Health posting this year. There are some subtle changes, but the key difference is identifying how to report a workplace fatality or “hospitalization, amputation or the loss of an eye.” This posting in available here. YES! In July of 2016, the United States Department of Labor (USDOL) revised the FLSA posting to include a section on break time for nursing mothers and note that some workers may be incorrectly classified as independent contractors “when they are actually employees under the FLSA.” This posting is available here. YES! The USDOL also updated the “Employee Rights Employee Polygraph Protection Act” posting in July 2016. This posting is available here. MAYBE… The following states have had changes to their minimum wage requirements this calendar year: Alaska, Arizona, Arkansas, California, Colorado, Connecticut, Florida, Hawaii, Maine, Massachusetts, Michigan, Missouri, Montana, New Jersey, Ohio, Oregon, South Dakota, Vermont, and Washington. These changes may require updated workplace postings. (Not all states require postings). Similar to Iowa, some states may also have cities and counties with different minimum wage requirements – so it is important to confirm those requirements! NO, BUT BE AWARE… In Iowa, the minimum wage of $7.25 is still the same; however there have been cities and counties enacting a different minimum wage for use within their jurisdictions. These include: Johnson County ($10.10 as of 1-1-17), Linn County ($8.25 as of 1-1-17), Polk County ($8.75 as of 4/1/17 and scheduled increases on 1-1-18 and 1-1-19), and Wapello County ($8.20 as of 1-1-17). Therefore, the required posting has not changed in Iowa, but you need to be aware of these wage requirements for specific areas in Iowa. IWD’s “Required Employer Posters” lists for state and federal posters available here. USDOL’s “Compliance Assistance Materials – Workplace Posters” (includes postings in other languages) available here. USDOL’s “FirstStep Poster Advisor” available here.